Philip Carabott taught modern and contemporary Greek history at King’s College London (1990-2011). He has published on politics, society and minorities in Greece of the modern era, and edited and contributed to Greece and Europe in the Modern Period: Aspects of a Troubled Relationship (1995), Greek Society in the Making, 1863-1913: Realities, Symbols and Visions (Ashgate, 1997), The Greek Civil War: Essays on a Conflict of Exceptionalism and Silences (Ashgate, 2004). He is currently based in Athens as an independent scholar, while remaining a Research Associate at King's College, London, UK. Yannis Hamilakis is Professor of Archaeology at the University of Southampton. He has published extensively on the politics of the past, on archaeology and sensoriality, and on the links between archaeology and photography. Amongst his books are The Nation and its Ruins: Antiquity, Archaeology, and National Imagination in Greece (2007), and Archaeology and the Senses: Human Experience, Memory, and Affect (2013). Eleni Papargyriou is a Visiting Research Fellow at King’s College London, where she taught between 2009-13. She has held research and teaching positions at Oxford University, Princeton University and the University of Ioannina, Greece. 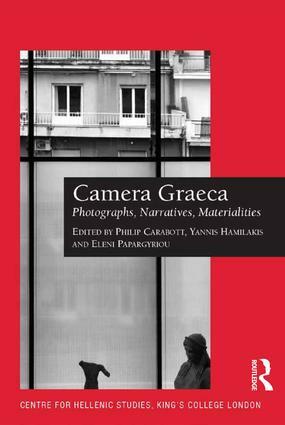 Her monograph, Reading Games in the Greek Novel appeared in 2011, and her articles include studies on intertextuality and the novel, the cultural implications of (self)translation, and the rapport between literary text and photographic image.